We are struggling our way through some kind of flu, presently. 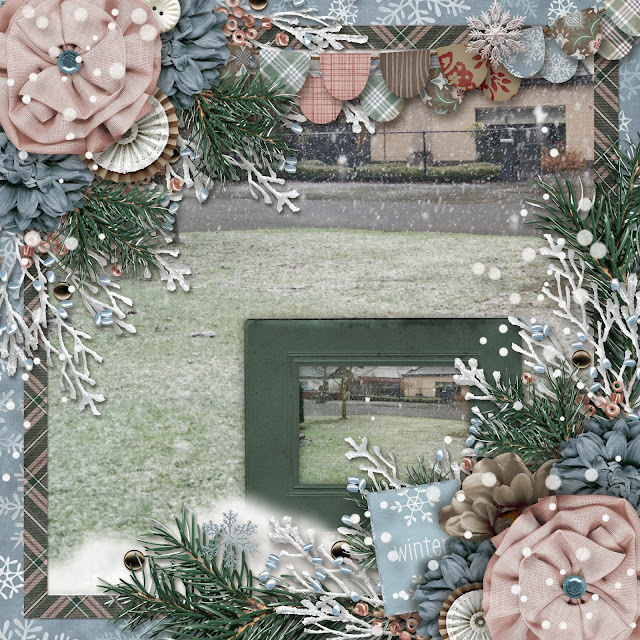 So with a very achy back and endless coughing, I give you today's blog featuring the cover to our Simple scrapbooking mini and we are nearly finished. I do still want to get one more page, which will be the inside of the cover. This book is taking me months to finish and so what. Scrapbooking should always be fun, right? Otherwise, you'll see the results in your finished project. If ya just don't feel like it, then let it go. Although, I would advise a few things, first. Go and peruse your favourite creative spots. Nothing gets the creative juices flowing for me like Pinterest. Man, the ideas and inspiration are unreal over there. 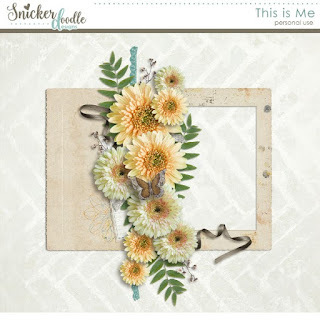 Maybe even look specifically at scrapbooking pages? Find a page that inspires you and sketch it out on some paper and take that to your desk or creative nest. I would also recommend, just getting started. Sometimes I don't think I feel like it until I actually have the scissors in my hand and I start working. Just get started and if nothing looks good to you, then maybe it's time to give it a break. I don't have a step by step tutorial for my cover, unlike the rest of the pages. I was scrapping with a new friend and I didn't want to make her feel uncomfortable for the time we hung out. I'm kind of a strong character and she was so sweet and timid. I tried my best to be low key. heheheh...Not an easy task! Allow me to just walk you through the steps for this kind of cover page. I'd say most of my cover pages are without pictures, but sometimes I do add photos to them. I just thought it'd be a great idea to show you various cover page ideas. So, I'll be blogging that up soon. Stay tuned! 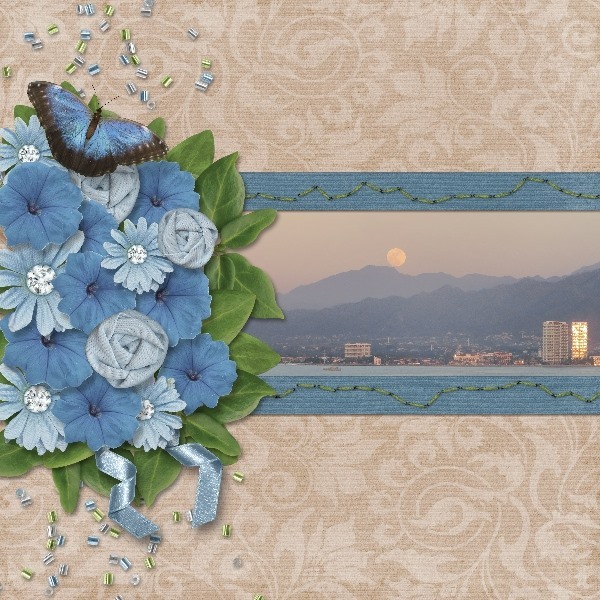 This page was so easy to put together because of all of the embellishments and stickers in the collection. I've said it over and over, how fantastic it is using collections. You save SO much time and your pages look super. I totally recommend it for people who do not work magic when it comes to just grabbing this and that from various kits and collections. I used that huge polaroid sticker frame and placed a paper in the picture spot. I wasn't super thrilled with the look until I traced around the inside edges with a good marker. It gave it a lot more contrast and looked so much better. I placed the Happy Time banner on black card stock and cut it out for more layers and contrast and used a thick dot to give it lift. A simple arrow with word title also backed up on black card stock and placed for decent symmetry. Then to finished up that cluster, I cut out the two leaves from a paper in the collection (I did this all throughout my mini for cohesion.) I used that same paper from under my polaroid frame for repetition and used a flower punch. I inked slightly around the flower for more yummy contrast and added a pearl to the center for just a touch of sophistication. The border was way too, easy! 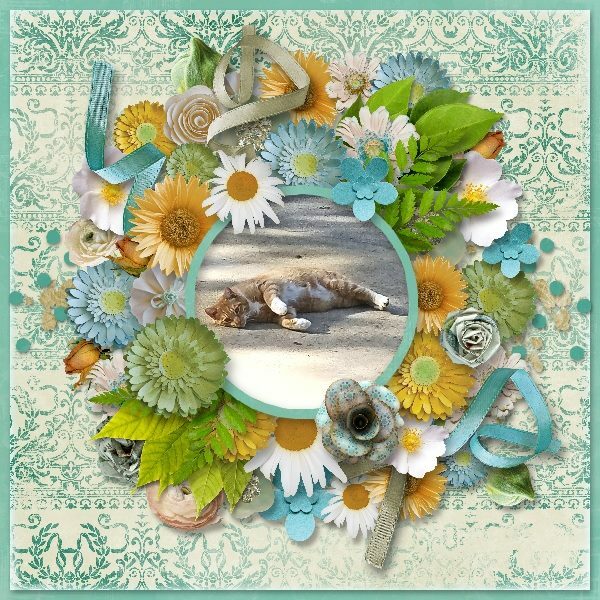 Since my page is 6x6 and the border was 12 inches, it was a breeze. Just cut that sucker in half and pasted it down. Then took my "Pearlz" drops and dotted in between the teeth and that's a wrap! I'll link you up with just a few other pages from the mini in case you've missed them. They have step by steps with them. Mmm...what a fabulous breakfast, with a fabulous view. 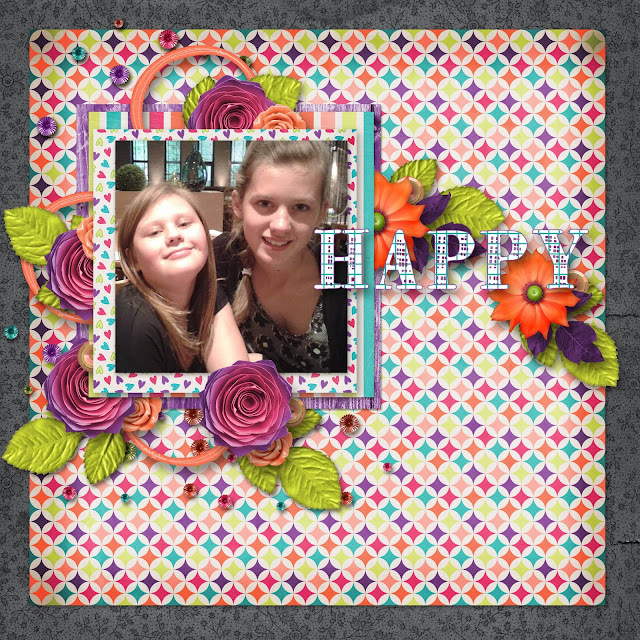 Scrapbooking can be really pretty and simple. It can take a lot less time and money, too. Click on this image to see more and find tips and tricks on how to scrap simply, quickly and inexpensively. You may have noticed I have a new banner in my side bar for Craftsy. I've been sharing a lot of ideas from Craftsy for months. I even started a Pinterest board for Craftsy because they had so many great ideas. When I first started The Cherry On Top, I covered everything. 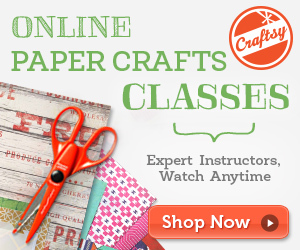 Cooking, cleaning, weekly menus, handy house hold tips and of course, paper crafts. 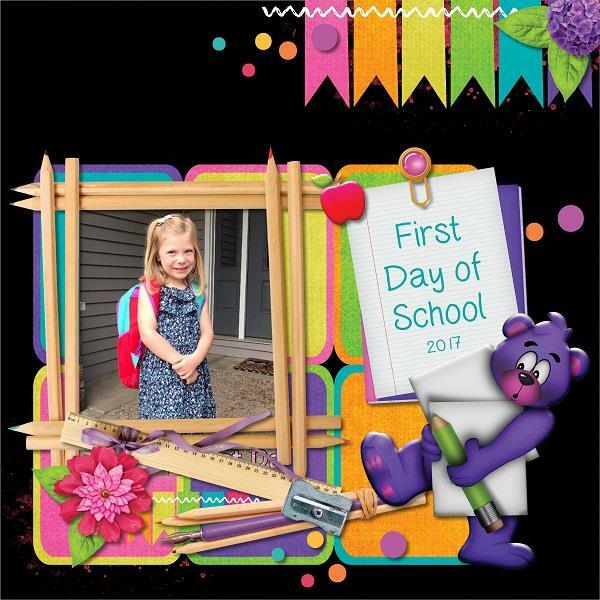 As you can imagine, it was not easy to keep up with and I found that my heart was set on the creative stuff and I decided to stick with just the design and scrapbooking aspect. On our page, I still share recipes and house hold tips, though. 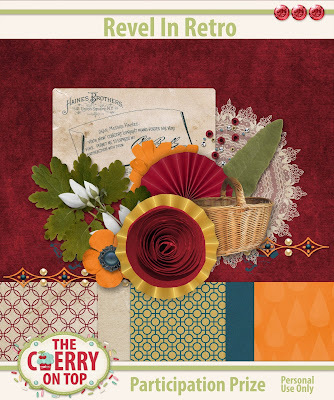 If you've never heard of Craftsy, I suggest clicking on this image and checking it out. It is exactly what The Cherry is all about! Taking your creative muses to another level. Making the best of your creativity. There are Cricut and Silhouette courses. You can learn to draw, paint, crochet, wood work, garden...even learn to make Mexican food and something I always thought was cool, make one of those T-shirt quilts. Pop over and see if there is something for you. You may want to sign up for the newsletter, too. I love the blog posts. Full of ideas, freebies and tutorials. 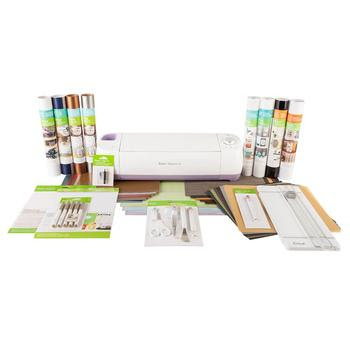 Speaking of Cricut, they are are having a limited time bundle deal. The time is almost up for this deal and it is a big money saver. I've been always wanting to make my own t-shirts and recently found out that Cricut has just the machine for it. Check out these awesome deals if they appeal to you. This right here, is my dream pack. 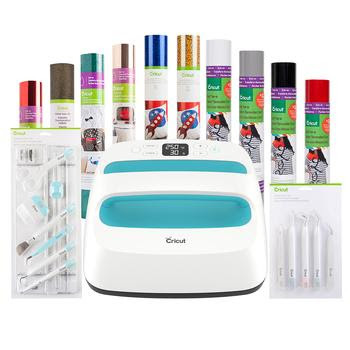 This awesome deal will save you nearly $300.00! Yes! The machine is even included! Thanks so much for checking out The Cherry! Check me out! I'm all early so far this year! Hehehe... I've got your nifty, free monthly calendar ready for download. Check out what else is going on with The Cherry. This year, I am offering free printable calendars. 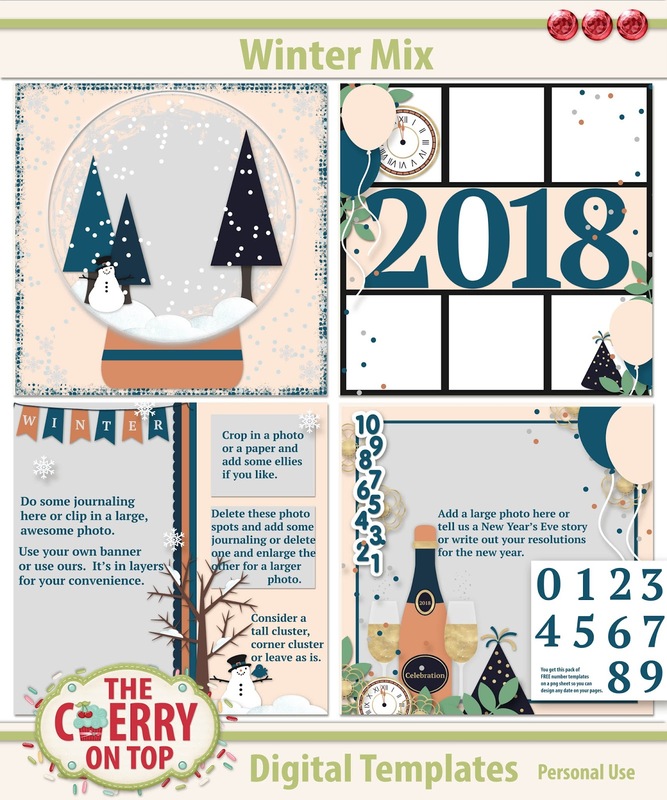 Each month, you'll receive a free printable calendar. I'm trying to get them to you, the Saturday before the end of the month. Fingers crossed I can keep this up all year. Hehehe...I've already designed through April! Blog readers will receive this jpg version of the calendar with an inserted photo. 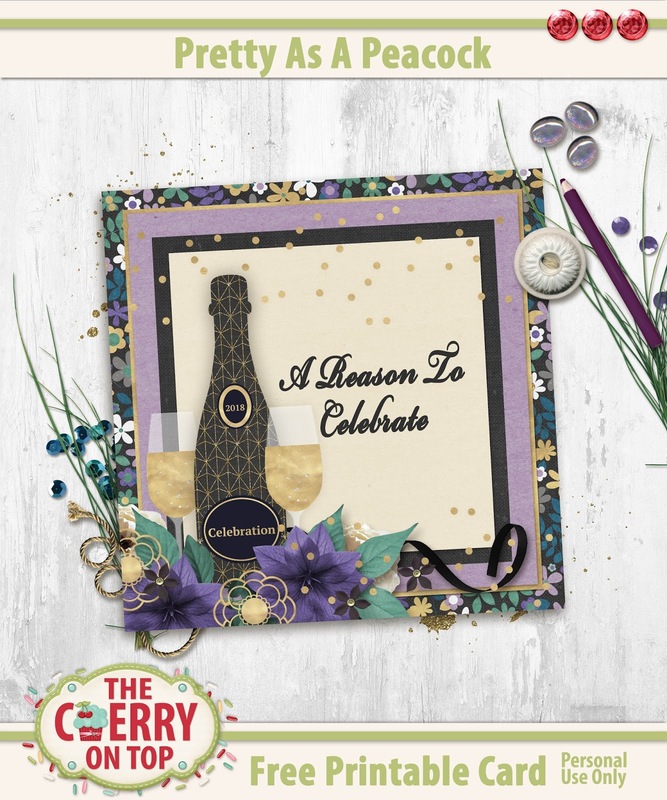 Newsletter recipients receive a png version of the calendar where they can insert their very own photo. How cool is that? If you'd prefer that, then sign up for our newsletter. We spoil you over there! Don't forget our Slow Scrap tonight! This is the participation prize. If you want to learn more, check out yesterday's blog or zap over to our nifty group on FB and click on the Events tab. I've Pinned this challenge in our group as well. Look for it while you are there and join us for the challenge. There are just a few more days and you'll get to choose a free template, too! HERE IS THE LINK FOR THE FREE CALENDAR. 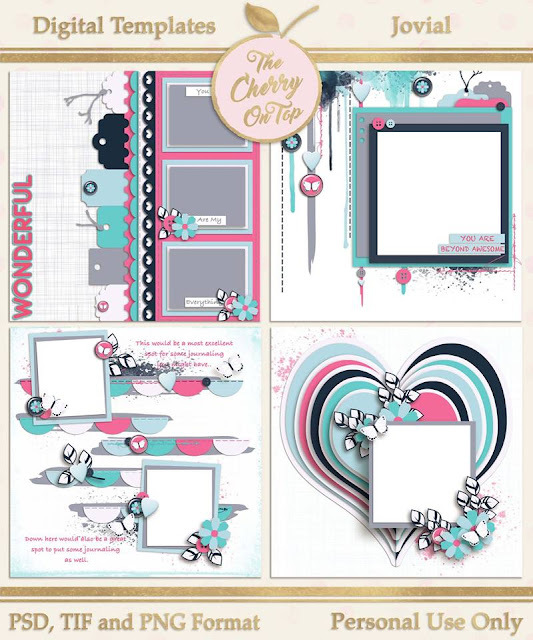 We are always so thrilled you're here and we hope you are just as happy to peruse the new scrapbooking inspiration and check out some of the new free stuff from around DigiLand. I've got some repackaged templates with two new ones and a super deal. 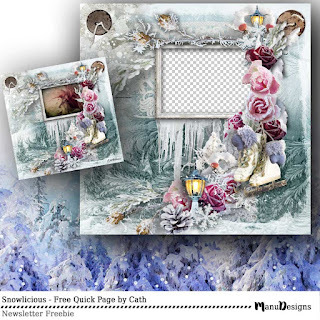 Of course we got several pages of scrapbooking goodness, challenges, free downloads and a look at tomorrow's free calendar. A big thank you to all of you who purchased our charity templates. We've taken down the links for those and I've packaged up my two templates from the charity set and added two, new ones. Of course I've put them in the shop at a Cherry deal for those of you who already have the first two. Grab them for just 1.50 (not including taxes). They come in png, tif and psd formats. Check out what I and my magnificent team have done with them. Don'cha just love those ellies tucked in to the various paper layers?! Give your pages dimension with layers and fabulous shadowing. I ditched the black outline effect I put on the template at the last minute. I just liked the way the colours all kind of ran into each other without them. I reused the word bits which I rarely do, but I dig these. See how I added several other elements around the hearts? Carol is a new addition to our creative team and I could not be more thrilled to have her join us. Just look at that fabulous page! Laureen is always a star with all of her pretty pages and she's just the sweetest, too. I think it shows in her work. How adorable did Theresa go with her little devil? Now, on her page I really LOVE the outline she put around her hearts. She changed the colours, too which helps make them stand out from the background. If you are wanting to know how to do that in PSE, I've got a video explaining it, step by. On to some other designers. 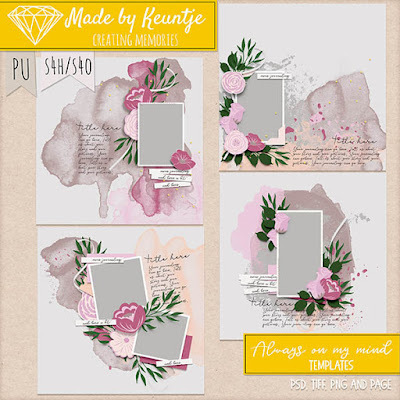 Dana from Made By Keuntje has some exquisite new templates available for you. 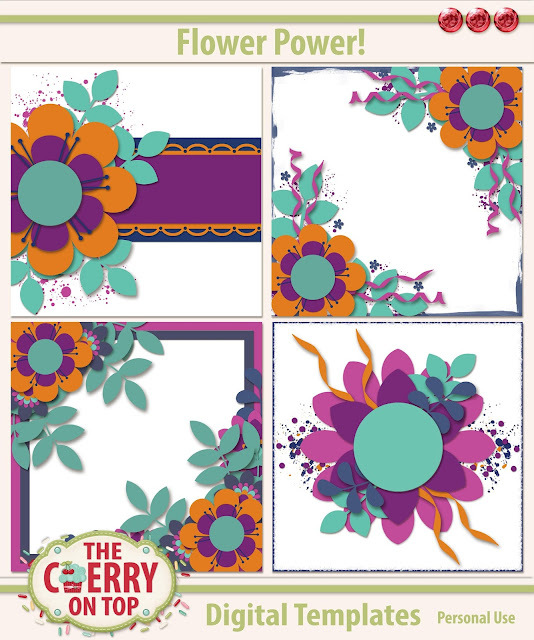 Have you ever bought a template pack where you loved them all so much, you didn't know where to start? That was me with this template pack. I decided to scrap up my other lovely niece with a free mini from Magical Scraps Galore. I thought the kit and the template went together so well. Have you signed up for our Slow Scrap this Saturday? You'll receive this free mini just for playing along with us. We always have a scrap-tastic time at our events. You don't have to know what you're doing to have fun. Some just come along to watch and chat and that's great, too. I just want ya to scrap! If you do want to see what a slow scrap is all about, head over to our group on FB and go to the Events Tab and say you are "going" to the Slow Scrap. It starts on Saturday, September 27th at 8:30 pm, Brussels time and 2:30 pm Eastern Standard Time. Those time differences make events a bit challenging. All you'll need is a scrap kit of any kind. It does not have to be one of mine and join us in the event at the assigned time. I'll give you steps and you scrap my steps according to your interpretation of them. After EIGHT steps, you'll have a beautiful page! Isn't that so cool?! I can't wait to see ya there and check out your page. When you submit your page, you'll get this free mini. I'll see about having monthly changes in the group. I've got January's up and I wrote up February's just this afternoon. We've already got several entries and they'll receive a free template for participating, too. I'm giving two choices this time. Keep scrolling to see them. They are awesome! These are the ones you'll be able to choose from. A traditional template and an artistic one. Once you see the challenge, you'll understand why I've chosen them. See the similarity? 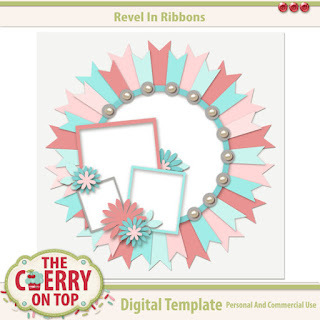 Revel In Ribbons are some of our most popular templates in our studio and I've put THE most popular one on sale for just .99 cents for a limited time. Just think of all you can do with this one! Get the awesome deal and add this beauty to your stash! Let's take a gander at some more freebies from around DigiLand. SnickerDoodle always spoils her readers, too. Pop over to her blog and see all of the awesomeness. 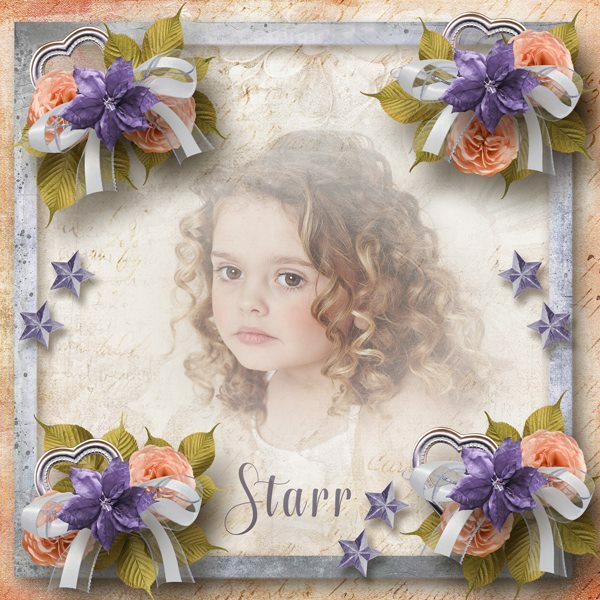 Danielle also has some gorgeous freebies in her FB group. I just love her designs! They certainly stand out from all of the rest. My scrappy sister Manu, is having a birthday celebration on her FB page. She's been giving out free Commercial Use, everyday! You may have missed some, but there are more. Go see what you can still get. This is a peek at tomorrow's freebie. 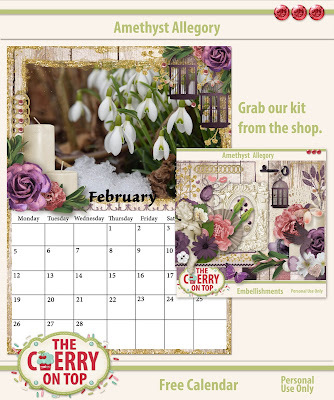 I've got February's calendar all ready for you and the coordinating kit will be releasing next Friday. Eek! Well! How set are you?! 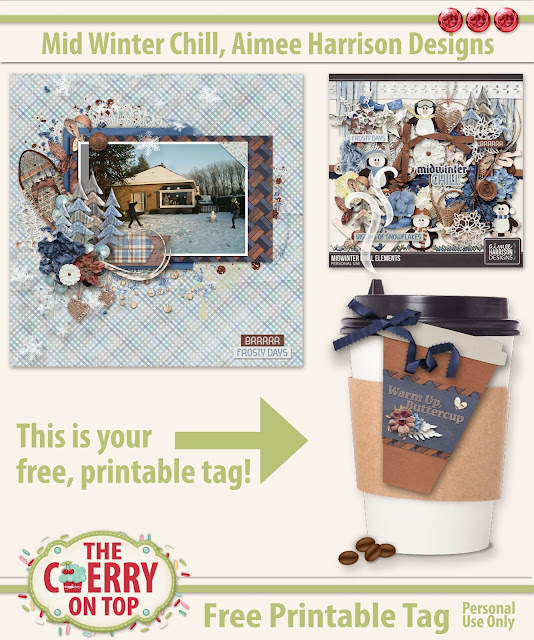 All kinds of free goodies, inspiration and some pretty cool templates to play with this weekend. 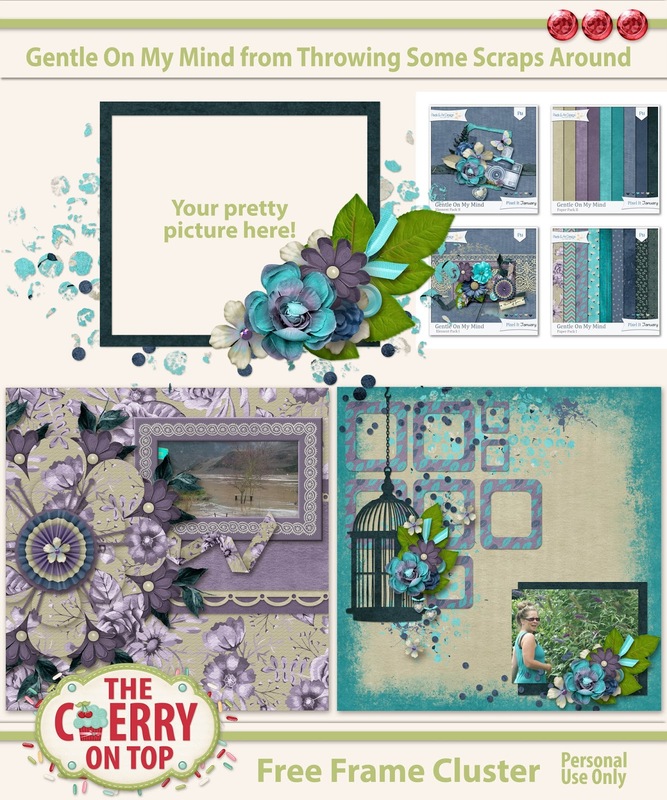 We've got fabulous new scrapbooking templates, inspiration to get the ole mojo going, a new freebie for you and a link to a lot more free stuff. I am completely convinced that you are going to just love these templates. These may be my most scrap-a-licously fast and easily templates to date. Just look what I did and under 30 minutes per page. If time is your top excuse, why you don't scrap, then these templates are ideal for you. I put a couple of twists in my pages AND I'm so sure you're going to love these that I put them in the shop for HALF PRICE! 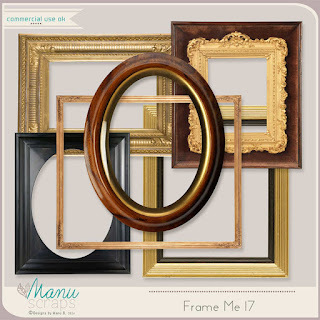 Just 1.50 for FOUR templates, for ONE WEEK ONLY. Let's check them out! 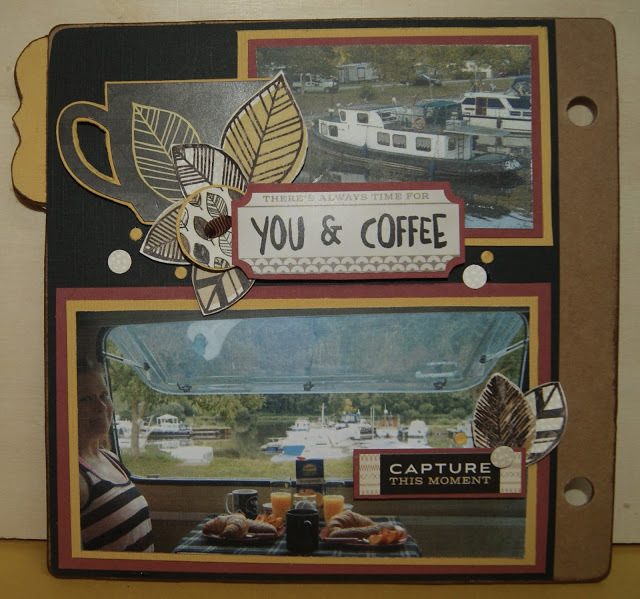 I used Throwing Some Scraps Around gorgeous new scrapbooking kit, Gentle On My Mind. I made a process video of this scrap if you want to see how I did it. I walk you through the entire process and dish out all kinds of tips and tricks using PSE and my templates. Ya just might get a giggle here and there, too. See how big and bold we went?! 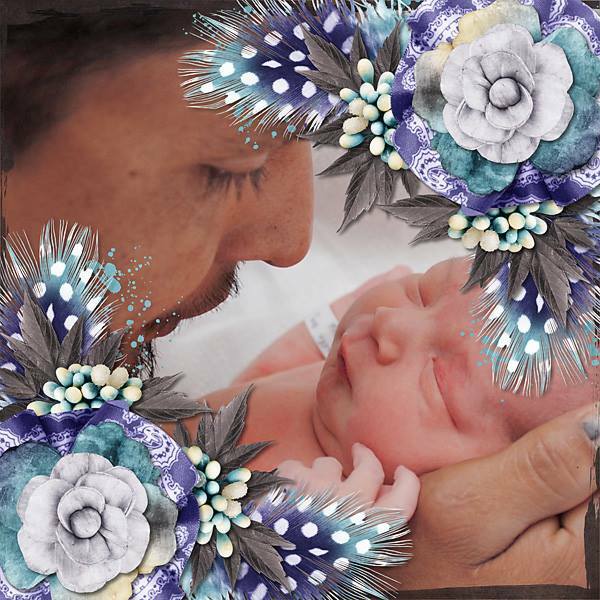 Go large with those flowers and embellishments as well as your photo. These templates can be used with traditional, artistic and realistic kits. 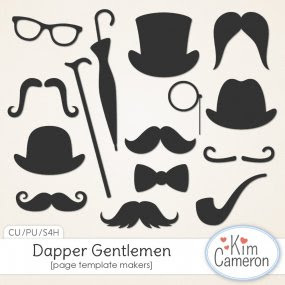 Seriously, any kind of scrapbooking kit you have will look just great with these templates. 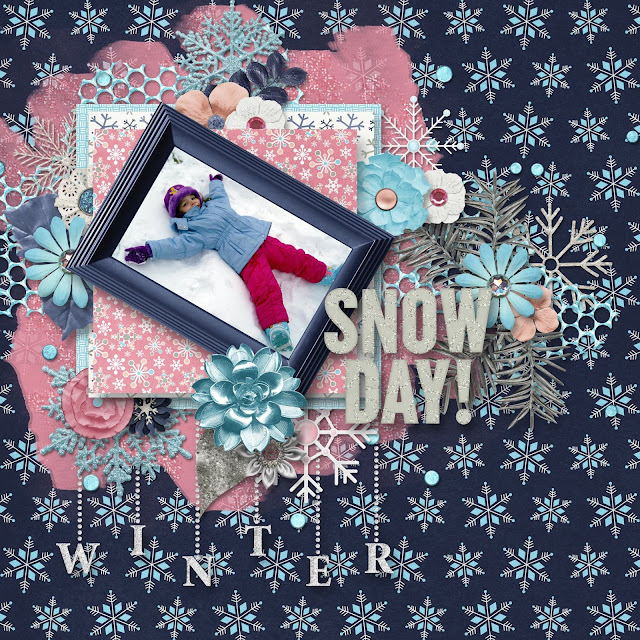 I even scrapped up my son using pink and combined a touch of an artistic flair with the splatter and scatter and Kim Cameron's new kit, Snow Flurries. If you're loving my page, I turned this into a quick page for Kim and she is giving it away for FREE to her newsletter subscribers. You may want to sign up for that newsletter. Maybe you need to learn how to outline your digital goodies? I can help ya with that one. I just uploaded a video on how to add a stroke to your goodies, change the size or width of the stroke, adjust the opacity of the stroke and change the colour. All in just a few, short minutes! My team has also scrapped beautifully. 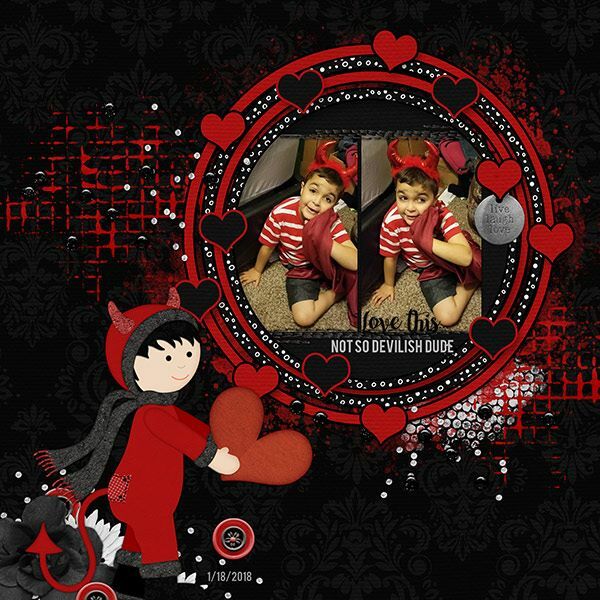 Check out Carol's two, fabulous pages. Here are two more really beautiful pages from my star, Rachelle. Michal always does magic with my templates. 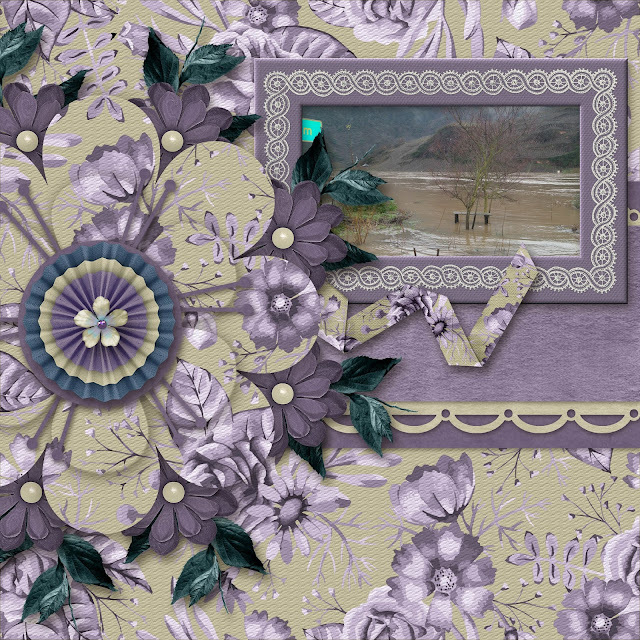 Laureen scrapped a beaute with our Creative Beast templates we released last week. Check them out by clicking on the pretty page. 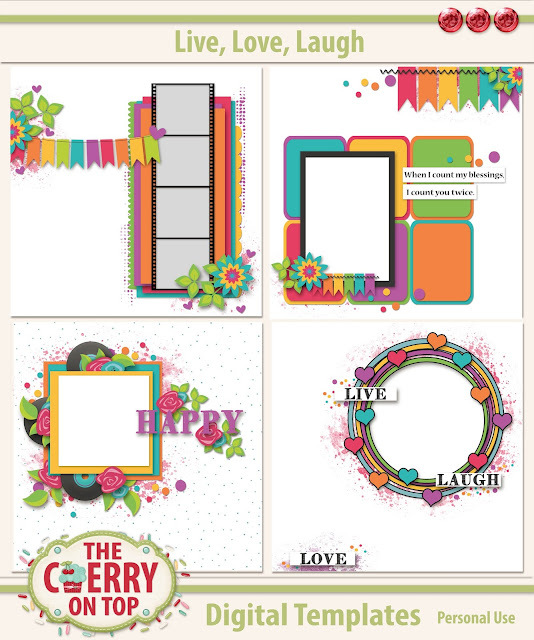 These templates we also released last week and they are special in so many ways. For one, you get SIX templates for only $4. You also will be putting your pennies in a very good place. 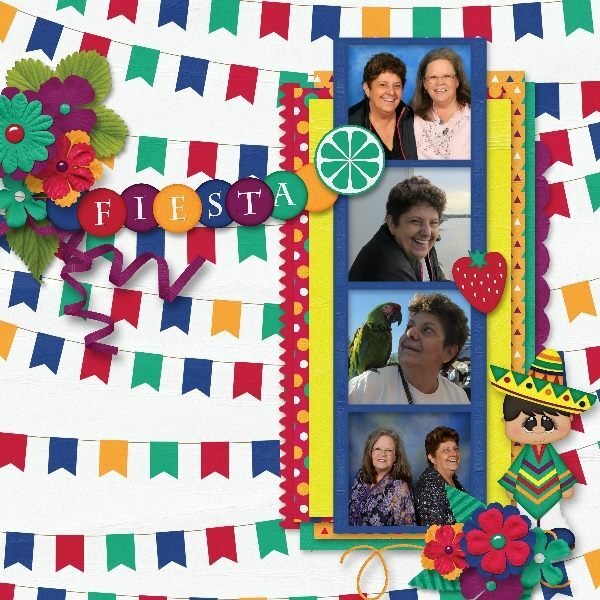 ALL of the proceeds from these templates will go to my scrappy sister's fund for a lap top. Thank you to all of you who helped us help our friend. We LOVE ya for it! 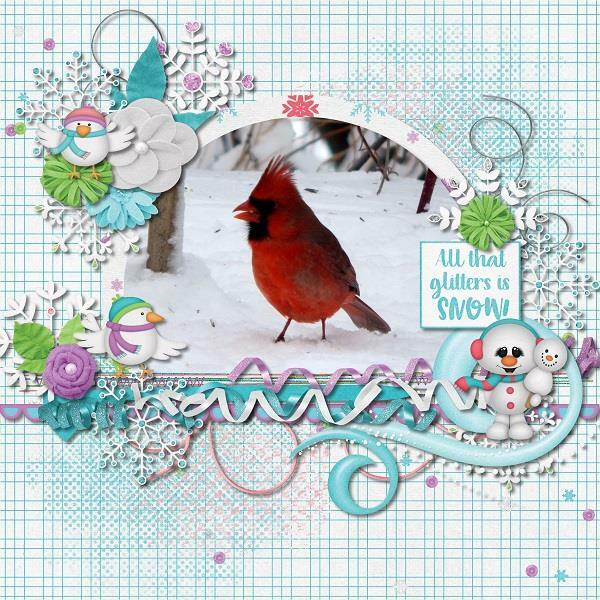 Carol scrapped up a really fun page with our charity template! You've been so awesome reading along this far. I bet you can't wait to get scrapping, but FIRST! Your new freebie designed by yours truly and Throwing Some Scraps Around. It's her gorgeous kit, Gentle On My Mind. Something a little different, right? Are ya into challenges? 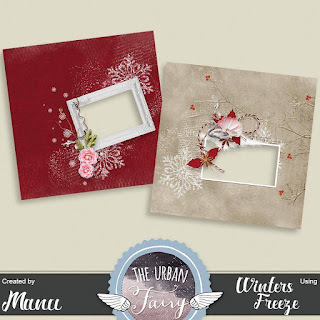 Do you want to amp up your scrap skills or perhaps expand upon your repertoire? 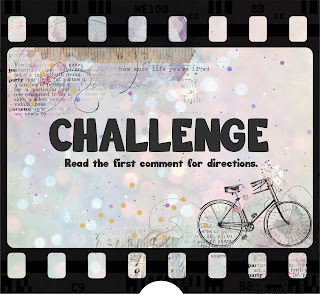 Pop over to our nifty scrappy group, read the comments on this post and join in on our challenge. Take a look at the fab participation prize! Head over to the group and join in on the challenge. You will be able to choose a traditional or a more artistic style template when you show off your page, in the correct, Pinned post following the directions. You don't even have to use our kits. You can use anyone's. Here's a great place to get you started on My Memories blog train. These are my scrappy sisters, Diane and Patty and you're going to love their designs. I made the suggestion, in our scrappy group, if they didn't have anything for the above challenge, they could collect all of these goodies and use those. Use this coupon code and save $10 on the already LOW price for MyMemories software. Look for the purple FREE Trial button if you want to give digital scrapbooking a spin and of course, The Cherry is here to help ya, too. I know it is really terrible of me, but I'm much more inclined to open my newsletters when there are freebies inside. If you're like me, then you absolutely need to sign up for Manu's newsletter. She spoils her blog readers and newsletter recipients really bad. Hehehe...You can sign up via her FB Page AND!!!! Hehehe... A little birdie told me she is going to have free daily downloads for TWELVE days on her FB page starting tomorrow. So get your cute tushie over to her page so ya don't miss it! These are her latest newsletter freebies. Pretty amazing, right?! 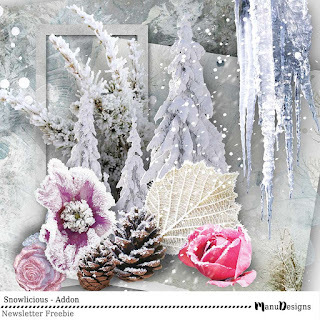 As usual, you have been walloped with scrapbooking inspiration, tutorial videos, freebies, templates and even a challenge this week. Don'cha just love that?! Thanks so much for stopping by the ole blog-a-rooney. How about hanging with us on FB, in our group, Instagram and or Pinterest? Ya gotta keep up with all of this scrappy goodness, right?! Our newsletter is definitely the best place for that. We mix it all up on Saturdays. Scrap digital and print or scrap digital, print and scrap traditional or hybrid. Isn't that so cool?! I think it's a fabulous mix of the two. You have a lot less mess and you need hardly any materials so no storage problems. Seriously, you might need a nice paper cutter, paper (of course) a printer, scissors and some adhesive. Sure you can get one of those fancy cutting machines like Cricut to make your project move faster and neater, but if you're not bad at fussy cut'n, then you don't even need one of those. 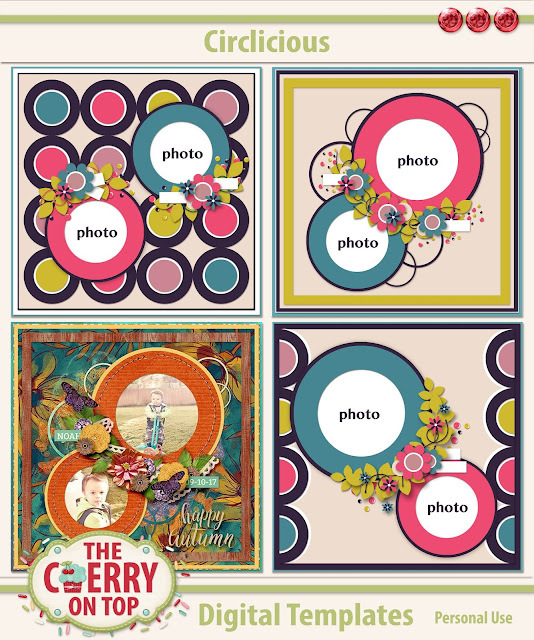 Check out the new, free printable, see how I designed it and check out some other recent printable hybrid projects from The Cherry. Enjoy! I've linked up all of the images so you jump around easily. Scroll down to the bottom for the free download. I always try to make my printables as useful as possible for the most amount of readers. Hehehe...I keep my wording a bit on the generic side so you can use these freebies more often. This card is 6x6 inches. 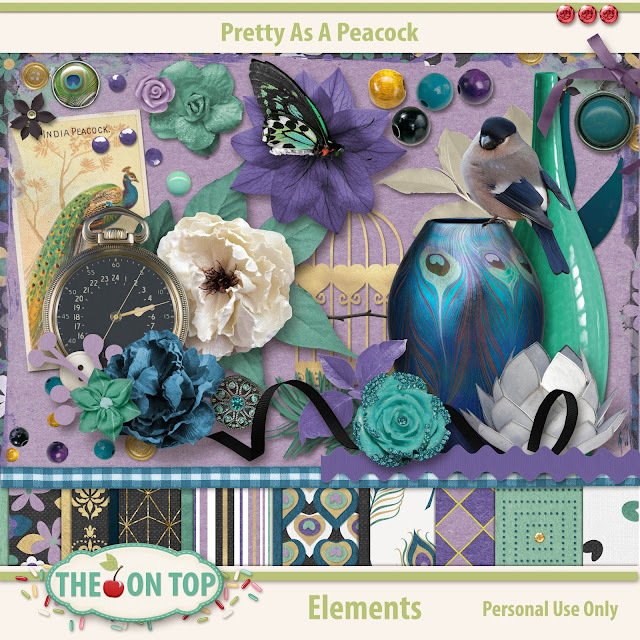 I used my new scrapbooking kit, Pretty As A Peacock to make your free card as well as Kim Cameron's commercial use goodies. I've got them featured a bit further down. I'll explain the process and show you how awesome it is using all kinds of different digital mediums to make beautiful goodies. Pretty As A Peacock elements and papers are sold separately. Notice some of these templates? I use them in my templates and you can use them for your personal use as well. Why not? They are priced to sell and are amazingly versatile! 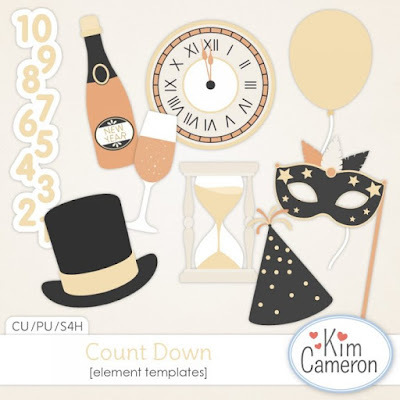 Start thinking about all of the different ways you can use these goodies from Kim. See how I used them to make that last template? Sweet, right? Use the goodies as representative pieces for template making or layer them up like I did with the bottle for this template so your clients or yourself can customise. Here's some really fun shapes! Design papers, elements and photo booth props!!! Make something super special for dad. 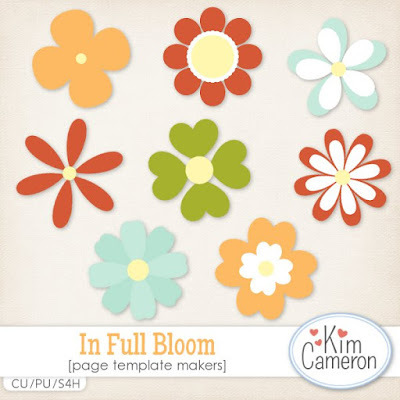 I just LOVE Kim's page template maker greenery and flowers. 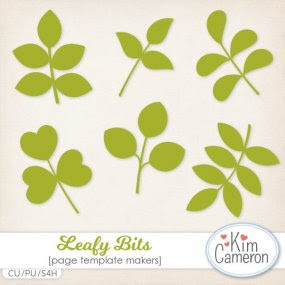 If you are a repeat buyer of my templates, you'll know these leaves well. Hehehe...They are meant to use as representative pieces meaning, you should replace these with your own greenery from a digital scrap kit. Aren't the flowers just great? Perfect for template making, but think also of the beautiful flowers you could make with these templates. Insert your own papers, textures, glitter, gems....Go nuts! See how I use them in my templates. If you love hybrids and or free printables, check out some of these. I just put this one on the blog, last week. Aimee's collections are just beyond gorgeous. 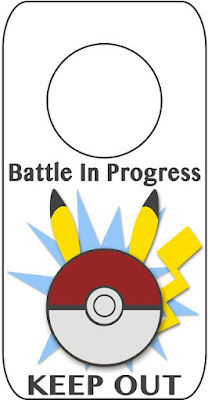 It's a free, printable tag. So cute! Here's a pretty book marker. This blog is FULL of free hybrid printables. I've got for all ages, guys and girls. 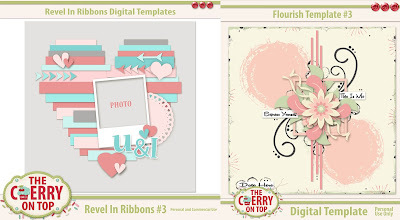 There are tutorials, free templates, tricks and tips...That's what makes us The Cherry On Top. HERE IS THE LINK FOR TODAY'S DOWNLOAD. Thanks so much checking out The Cherry! Consider following us on our social spots like Facebook, Pinterest and Instagram or join us in our scrap-a-licious group on FB.